Going through everyday life, experiencing various seasonal events, all in English. Also includes reading, writing and a variety of activities. Please refer to the Preschool Fee list. From the ages of two to six, children begin to lay the foundations for who they will become during their lifetime. At our preschool, English is taught first and foremost as a communication skill. Rather, we think teaching a balanced lifestyle through experience is paramount in the development of all children. There is no better time for it. That is why we, the staff, think of ourselves not as English teachers but rather as preschool teachers, and that is how we aim to spend each day with our students. As a result, every day becomes one of new discovery and revelation, and we too learn much from the children we teach. In the mornings, we use a range of colorful materials for the children to not only become familiar with reading and writing, but also with science and geography. Since we limit classwork to the morning periods, it is easier for our students to stay concentrated in each lesson. Using this method, students rapidly gain a high level of fluency in spoken, reading and written English. It is one of Cosmos' distinguishing features. The afternoons are scheduled differently each day of the week and include activities such as sports, music and rhythmic exercises, gardening, making crafts, using all five senses, getting them to think for themselves, to learn to grow and live as they choose. 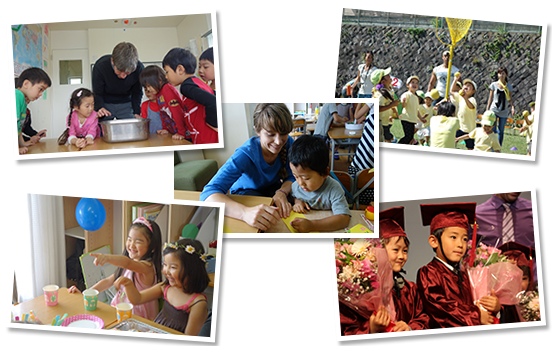 Be it Halloween or Setsubun, Christmas or the Girls' Festival, we use cultural events from home and abroad to give children opportunities for introspection and reflection. Our triennial presentations are not only opportunities for our students to express themselves, but also occasions for them to learn the value of long hours of practice and of cooperating with friends towards a common goal.